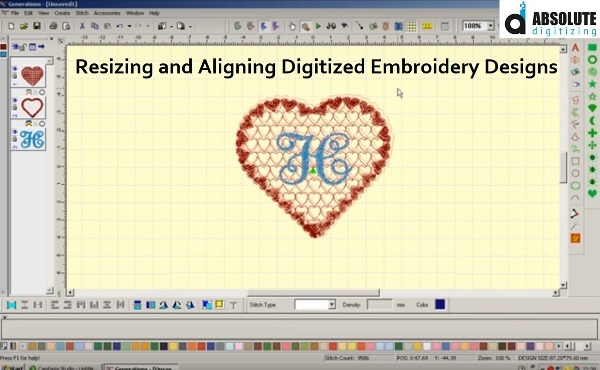 How to Resize and Align already Digitized Embroidery Designs? 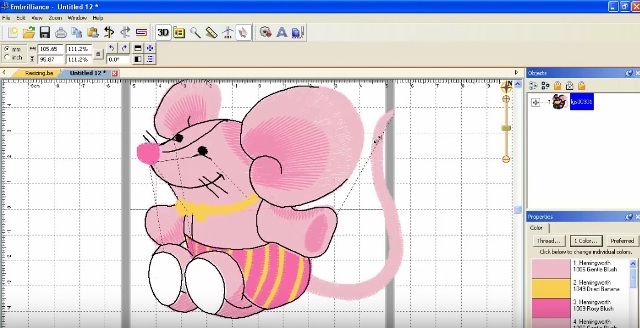 Resizing already digitized embroidery designs is not a straightforward task like resizing an image file. Digitized designs represent stitches having particular characteristics. If the size of the design is altered, related stitch parameters have to be adjusted and aligned. Many a time, customers want same design on multiple products. Clearly, the same design size will not work for the jacket back, caps and T-shirts. The good news is that if such a situation was anticipated during embroidery digitizing, you don’t need to worry a lot. Otherwise, designs have to be digitized from scratch; something nobody will be much pleased to do. By incurring some nominal measures, while digitized embroidery designs are prepared, you can avoid the unnecessary labor of digitizing all over again. as a professional, one should anticipate such upsells, even if such a request was not made by the customer in the first place. For this article, we will be seeing how to align and make adjustments while up-sizing a small embroidery digitized design to a large one. Say, converting a hat logo to a jacket back design. Therefore, all instruction only hold true for up-sizing. For downsizing, that is resizing a large design to a small one, following instructions are not always relevant. As mentioned before, the most convenient way is to digitize in a way so the resizing becomes easy and quick. If that is not done, stitch properties have to be changed. Start with the running stitch outline and convert them to column stitches. 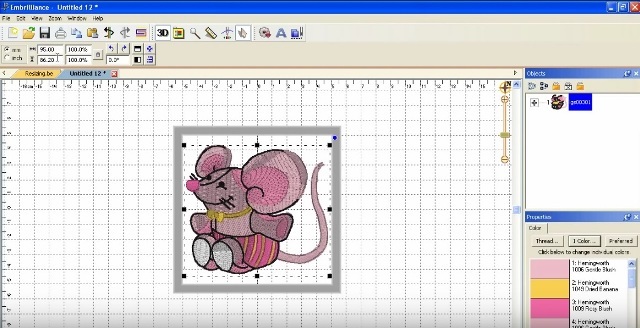 Embroidery digitizing software will allow you to choose multiple groups of stitches at once, and convert them to a particular stitch with just one click. Then, you can either widen or shrink these column stitches to ensure that they fit. In doing so, ensure that underlying fill has edge run underlay. Column stitches must be sufficiently offset to the underlay in a manner that the new outline does not pull out. While running stitches are converted to column stitches, column stitches will remain as such. The only difference will be in their length. For larger designs, column stitches must be enlarged. However, if column stitches are too long, they can break. So, instead of going with very long column stitches, choose fills. Long stitches cause extra pulling which should be replaced with stable fills. The only concern here is to lose the sheen that comes with satins. The arbitrary needle penetrations will allow you to attain sheen that flows with letter contours, and also avoids pulling out of stitches. Underlays will be mostly distorted if the above lying design size is increased. To solve this, additional underlay must be added to cope with an increase in pull. Usually, a double fill or tatami underlay at 90 degrees would suffice. Adding the underlay is a complicated process and a better way is to program underlay beforehand. Choose layered underlay from the beginning and you can avoid the frustration of adding underlay again and making other related adjustments. In case of layered underlay, there is no need to add additional underlay. It will lower the stitch count by 30%. Consequently, there will be no fear of thread breaks as there will be no additional pull. For a layered fill, standard practice to create three layers. In each layer, 1/3 of total stitches are used. For instance, if 18,000 stitches will be used in total, a single layer will only contain 6,000 stitches. An alternative to conventional underlay, this background fill, make resizing of digitized embroidery designs much more viable. Digitize the background fill using the re-calculated stitch density. For background fills, you have to make sure that stitch is zero. With the first layer, start at the top and digitize your way to the bottom. Once done, duplicate it twice. For the second layer, change the start and stop positions. Start from the bottom and finish at the top. Now, add an edge run underlay to this layer. Finally, add the third layer, starting from the top and finishing at the bottom. The layered background fill is now ready. 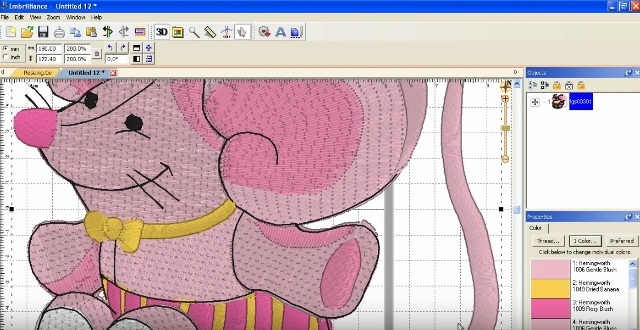 Size of embroidery design can now be increased or decreased, without increasing the susceptibility to thread breaks. Apart from this, background fill provides a stable ground where digitized embroidery designs can be easily registered, without requiring the push and pull compensation. Large designs magnify even the minor details of your work. In addition to magnifying the minor details, enlargement of any design opens up, otherwise concealed, blank and plain spaces. Therefore, certain elements have to be added in order to retain consistency of the design. Texture provides an easy option to fill-up this space. In the background, you can add an embossed version of the top-stitched logo. As only top fill layer is visible, add the texture to the third and topmost layered fill. An embossed logo is only a texture option. You can experiment with other creative textures like the matte finish or create gloss by using larger stitches or use any other suitable texture. Just don’t have plain space left on large embroidery designs. It just doesn’t look right. As you can see, layered fill smooths the process to a large extent. Apart from resizing, layered fill also helps to solve other embroidery registration problems like distortion. So, as a standard practice, try to learn and use layered fill in your future digitizing. Knowing that it is an option, you can use the original fill. Reduce its density and duplicate it three times. Change the start and end position of the second layer and this is how quickly you have made the adjustment for resizing. Compare this with re-digitizing an embroidery design to increase its size, and you will feel like having a much quicker and smarter technique at your disposal. Hopefully, these tips were helpful in becoming a better digitizer, even a bit. For receiving digitized embroidery designs from professionals, reach out to us. We digitize embroidery designs for only $1.75/1000 stitches with a very quick turnaround time of 2-12 hrs. Get a quote today and order the best quality at the lowest prices.